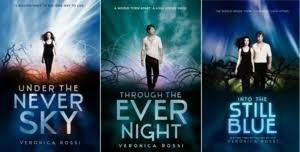 Under the Never Sky by Veronica Rossi is a fictional series that follows the life of 17 year-old Aria, who has lived within an enclosed domed community her entire life, called Reverie. That is, until her mother goes missing. Now, she must push herself past the unknown world that lies beyond Reverie, known as “the death shop” and test her will in the harsh wastelands where the weather is deadly and unpredictable and where threats lurk everywhere. Aria’s hopes and chances of finding her mother are wearing thin when she realizes the deathly savage and feuding tribes that inhabit the wastelands, until she happens to run into Perry, who is also a “savage” living in the wasteland, accompanied by his kid nephew, Talon, and his best friend, Roar. She is reluctant to be helped by exactly those who her people are protected from, but these outsiders may be her only chance of survival and the only decent shot she has if she ever hopes to find her mother.